The essence of this Namibia lodge is privacy and relaxation, which makes it the perfect place to ease into your holiday or end a hectic game-watching safari. Although Kaza Safari Lodge (formerly known as Impalila Island Lodge) is on Namibian soil, it is most easily accessed from Kasane in Botswana - the entry town to Chobe National Park. This makes it easy to combine a Botswana animal-watching safari with a visit to this restful lodge. Dozing on a pool lounger under the glorious African sun is an exquisite way to relax. The more active can walk to the giant Baobab tree, meeting local villagers on the way. Keen fishermen are always content here and should catch tiger fish and tasty bream, which the chef will prepare for dinner. Food is of prime importance here and world class cuisine is served on a table decorated with papyrus fronds and Baobab flowers. Dinner can be a romantic affair at your own moonlit table, or a sociable event at one long table hosted by the manager. While at this Namibia safari lodge you are assigned your own ranger, usually from the local area, who looks after you and is a mine of information about the flora, fauna and culture. 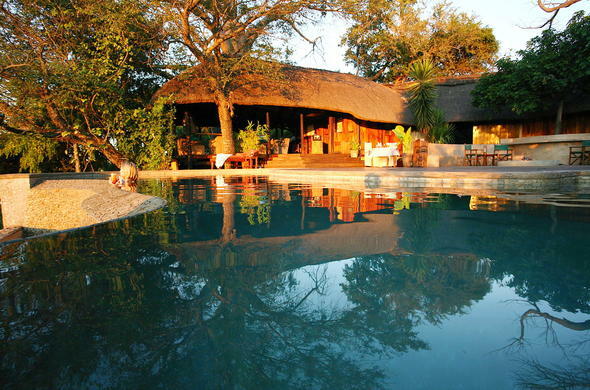 This really is quite a remote Caprivi lodge where the emphasis is on pure relaxation. Fly fishing or traditional angling from motorized boat is possible. Kaza Safari Lodge is well known for its exciting tiger fishing. The luxurious Kaza Safari Lodge's architecture incorporates wood, thatch and giant Baobab trees. The Chobe River provides game viewing by boat and excellent fishing.